Katie Melland stands next to her mural of teens' favorite things and places in New Canaan. Katie Melland, a junior at New Canaan High School, submitted the winning design entry to the Outback Teen Center mural contest held last fall. 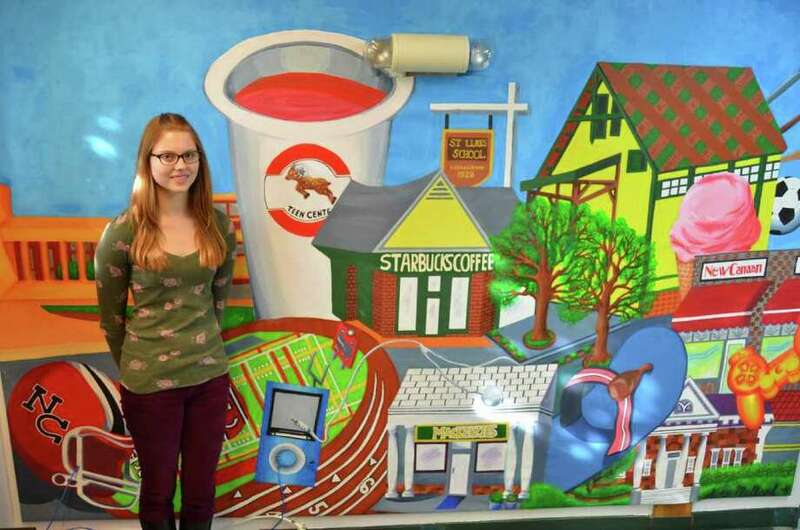 Katie created a mural of teens' favorite things and places in New Canaan. The mural features key sites around the town including the high school facade, stadium, track, Outback Teen Center, New Canaan Library, St. Luke's School welcome sign, Mackenzie's storefront and the New Canaan Diner. Katie was inspired by a mural that she saw in the Las Vegas airport when she was returning from a family trip to Zion and Bryce National Parks in Utah. She painted the mural in acrylics, working many evenings over the course of several months. The mural is now installed on the bottom level of the Outback Teen Center. Thanksgiving cookie decorating will take place Wednesday, Nov. 23, from noon to 3 p.m. Grades five threough eight are invited to join them after the half-day of school to decorate cookies and cookie bags to take to your friends and family for the holiday. Cost is $5. Pictures with Santa will take place Sunday, Nov. 27, from 11 a.m. to 4 p.m. Stop by the Outback to meet Santa and take a picture for the holidays.